Do you think Nancy Pelosi will investigate her California pal Maxine Waters for conflict of interest? There is still an ethics panel in the House, isn’t there? When Rep. Barney Frank was looking to aid a Boston-based lender last fall, the Massachusetts Democrat urged Maxine Waters, a colleague on the House Financial Services Committee, to “stay out of it,” he says. The reason: Ms. Waters, a longtime congresswoman from California, had close ties to the minority-owned institution, OneUnited Bank. Ms. Waters and her husband have both held financial stakes in the bank. Until recently, her husband was a director. At the same time, Ms. Waters has publicly boosted OneUnited’s executives and criticized its government regulators during congressional hearings. Last fall, she helped secure the bank a meeting with Treasury officials. 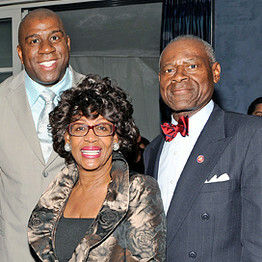 Rep. Maxine Waters, center, with Earvin “Magic” Johnson, left, and Ms. Waters’s husband, Sidney Williams, at the 2009 BET Honors Reception in Washington, D.C. But Franks also wants the bad guys to cooperate and behave. “I urge you going forward to be ungrudgingly cooperative. There has to be a sense of the American people that you understand their anger … and that you’re willing to make some sacrifices to get this working, ” Franks said. Franks also said he was angry that the TARP wasn’t executed better by the bankers. But wasn’t he there in the Financial Services Committee, crafting the provisions of the TARP? Franks also said the administration was taking “too much time” developing a foreclosure plan and called on companies that hold or service mortgages to suspend foreclosure proceedings until it is released. He took shots at Treasury Secretary Tim Geithner’s bank bailout plan along the way. Franks has criticism for everyone all around but hasn’t taken any responsibility himself…. You are currently browsing the archives for the Barney Franks category.